This composite image shows an envelope of 60-million-degree gas around a young cluster of stars, known as the Arches cluster. 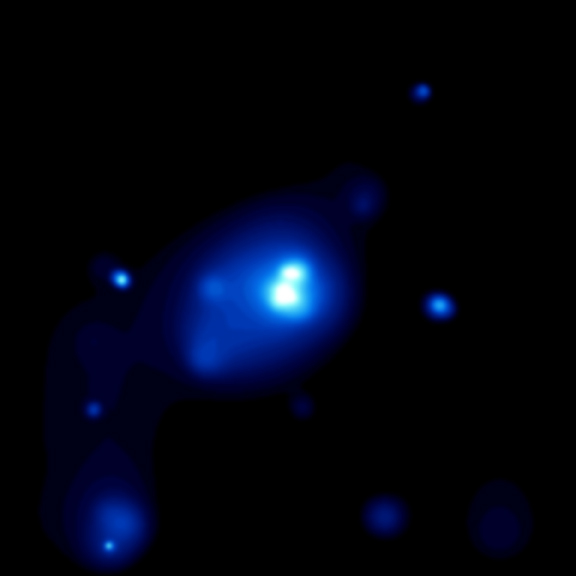 The Chandra data, shown as the diffuse blue emission in the inset box, overlays a Hubble Space Telescope infrared image of the same region, in which some of the individual stars in the cluster can be seen as point-like sources. 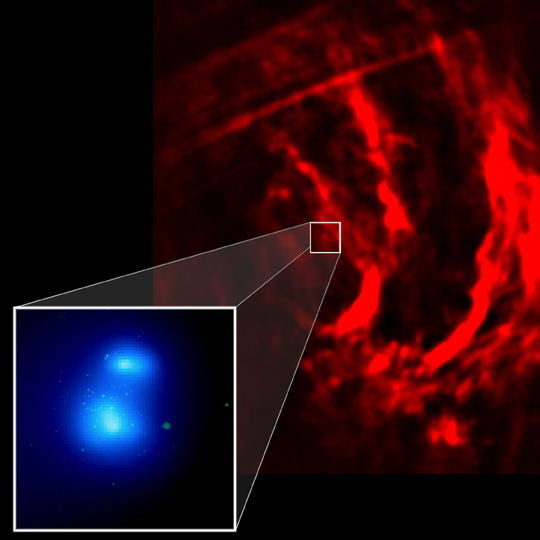 Both the X-ray and infrared observations are shown in context of the spectacular filamentary structures that appear in radio wavelengths displayed in red. Radio observations were obtained using the Very Large Array (VLA) of radio telescopes. The Arches cluster contains about 150 hot, young stars concentrated within a radius of about one light year, making it the most compact cluster of stars in our Galaxy. Many of these stars are 20 times as massive as the Sun and live short, furious lives that last only a few million years. During this period, gas evaporates from these stars in the form of intense stellar winds. The envelope of hot gas observed by Chandra is thought to be due to collisions of the winds from numerous stars. Studies of the Arches cluster, located about 26,000 light years from Earth, can be used to learn more about the environments of "starburst" galaxies millions of light years away where this phenomenon may be occurring on a much larger scale. Coordinates (J2000) RA 17h 46m 22s | Dec -28° 51´ 36.4"